An Oxford button-up should be a closet staple the same way bread and ancient squeeze bottles of mustard are kitchen staples. This durable chambray pick is the ‘Rutledge’, made in-house by JackThreads’ private label, Goodale. The material's casual enough to allow the shirt to be worn un-tucked over dark-wash jeans, while the silhouette's classic enough to wear tucked-in with chinos. The power of choice is yours. The henley is the low-key game changer in a clothing arsenal. Beyond being physique-flattering on basically everyone, this classic can be paired with jeans, joggers, and chinos. Go ahead, unbutton it all the way. Mankle season is upon us. Keep it simple and comfortable with these fresh canvas kicks that’ll look great while you’re kicking it in a pair of joggers or rolled-up chinos lounging deck-side at your favorite rooftop bar. Or your favorite patio. Whatever, as long as you’re outdoors and there is beer. 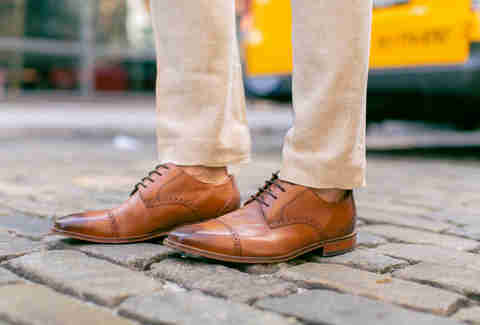 For this time of year, brown shoes will cover more looks than a black pair. The ultimate everyday footwear, these play dressed-down with jeans, with bright chinos for a semi-casual work-look, and of course, with suits -- especially a navy job. This particular pair of captoe oxfords are hand-burnished for a weathered, vintage look that’ll make you look so casually distinguished, doormen will let you up to rich strangers’ apartments. JackThreads’ buyers chose this deconstructed knit number not only for its versatility (it would look just as good thrown over a white tee as it would with a shirt and tie) but also for its comfort factor. Though technically everyone’s comfort factor is up now that Fear Factor’s been cancelled. April showers bring waterproof windbreakers. 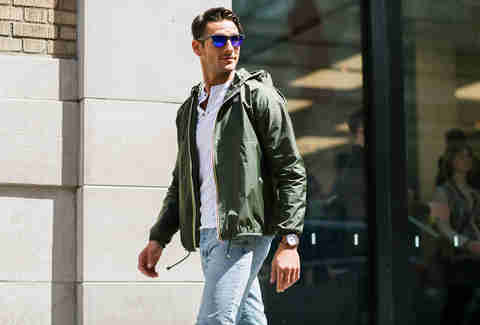 Avoid neon colors unless you want to look like 1992’s most outgoing tourist and opt for the military green of this lightweight K-Way jacket instead. Now that the sun is back and your face doesn’t look like you starred in The Shining, hop off that treadmill and get moving outside with this lightweight hoodie from Reebok, durable enough to withstand your sweatiest workout. Gross! But healthy. Keep it up, man. It doesn’t get more classic than the Hawker Hurricane by Avi-8. 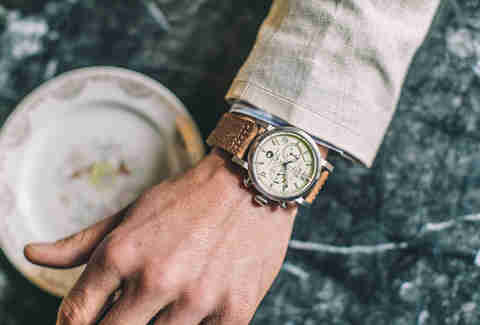 The vintage-inspired brown leather band and off-white face mesh well with most items in a spring/summer wardrobe (think the brown oxfords or the button-up chambray shirt). Lightweight and breathable, this dressier staple works for spring, summer, wedding season, or Miami in general. Pair it with brown oxfords and wayfarers for that “I valet my yacht, but I’m actually still a pretty cool and approachable guy” vibe. Forget about spring essentials. A pair of classic black wayfarers is pretty high up on the list of life’s must-haves. 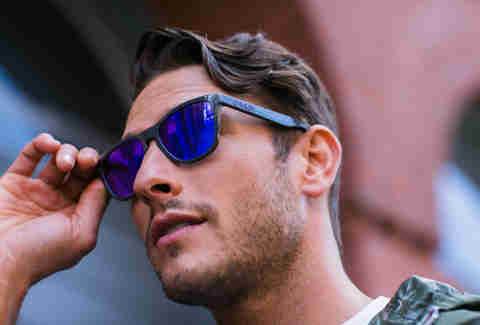 Pair with a pair of black jeans and a plain white tee for a timeless look, and add a little modern flair with the purple lenses. And now you've got everything you need to get noticed this spring -- except a puppy, which frankly is a really weird thing to buy quickly and efficiently over the Internet.